Is your existing wooden deck splintering, splitting, warping or rotting? Instead of spending more time and money in annual deck repairs, it may be time to invest in a paver patio design that will be of benefit from a cost and appearance standpoint over the long term. A concrete paver patio will offer you a number of distinct advantages over a wooden deck. A paver patio is easier to maintain. Wooden decks require annual maintenance that includes cleaning, staining and replacing worn or rotted deck boards. Once a paver patio is installed, little maintenance is required. A periodic resealing may be needed, but aside from resealing, an occasional pressure washing should be the only maintenance necessary. Also, Stone features, such as a fire pit or stone steps, can be beautifully integrated into a paved patio design. A fire pit creates a warm outdoor gathering place for the family — for apparent reasons, wooden decks aren’t a good fit if you would like to incorporate a fire pit into your outdoor living space. Stone steps can also be incorporated to add functionality and visual interest to your landscape design. That’s not all. 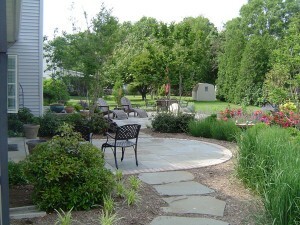 A paver patio can be designed to feel more connected to the rest of your landscape design and the exterior of your home. Brick, stone and concrete pavers are now available in a range of styles and colors that can compliment the exterior architecture of your home. Pavers can also be designed in a free-form manner that looks and feels more cohesive with the rest of your backyard landscape.